The UK is setting out on the path of an independent trade policy at a difficult time. Public interest in trade policy has never been greater, with US political rejection of a trade agreement negotiated by their government the prime example of the challenge of successfully pursuing a long-term strategy. The UK has a tradition of outward-oriented economic policy, but trade agreements are seen by many as a problem. Trade policy always has the potential for controversy. Domestic and international interests ask for the protection or promotion of their interests, and this is not fully possible, not least given some are contradictory. Successfully managing these trade-offs is at the heart of effective trade policy. Disappointingly the management of these trade-offs has scarcely been discussed by UK politicians of either government or opposition parties. Should this situation continue we can expect a UK trade policy agenda to run into difficulty. A new Free Trade Agreement (FTA) with the US would present the greatest risk. Likely US asks in terms of different agricultural standards have already been widely discussed and at least as significant could be any perceived risk to the NHS from asks such as transparency in medicine pricing. Even an agreement with New Zealand could be controversial if it was thought to threaten UK farmers. It won’t be possible to avoid all controversy, but such controversy need not stop trade agreements, as shown by the other signatories to the Trans Pacific Partnership (TPP) who kept going after the US withdrew. Why did these countries succeed given in many cases they also faced significant domestic opposition? We have identified six pillars of trade policy which are crucial to the success of a country’s trade policy, and against which we have evaluated UK performance to date. Achieving a degree of consensus in trade policy sufficient to overcome inevitable controversies is the first of these. Given the lack of discussion to date this is the area we judge to require most urgent attention. 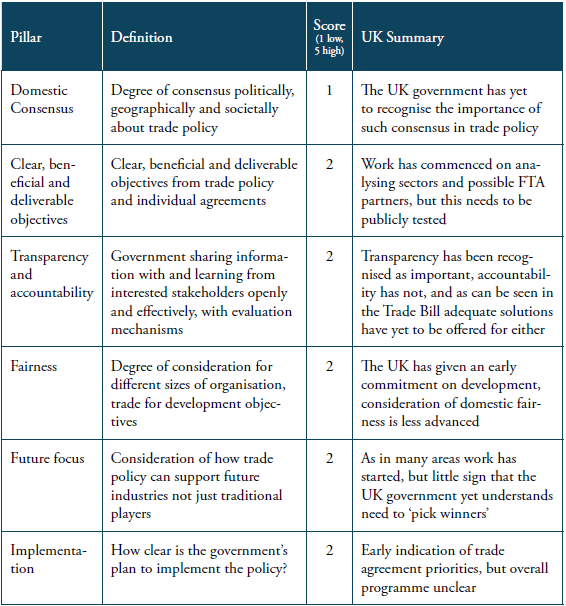 The UK starts with some strengths in developing trade policy. Most importantly there is a relatively strong support for trade in general, reflected in consistent UK support for trade liberalisation within the EU through governments led by different political parties, and more recently the relative agreement on maintaining existing EU trade agreements after Brexit. A trade policy combining this with the maintenance of high UK standards would, for example, be likely to attract widespread support, particularly if built upon open, clear management of the required trade-offs. But this cannot be taken for granted; rather the UK government must engage widely following best practice. We will return to this scorecard at regular intervals to monitor ongoing progress. In leaving the European Union the UK will conduct a fully independent trade policy for the first time since January 1973. This independent trade policy may come into force gradually, with an Implementation Period from March 2019 to December 2020 seeing the UK in a continuing Customs Union with the EU, prior to having full control and the freedom to implement new Free Trade Agreements (FTAs) from January 2021. This paper will assess the UK’s readiness to successfully run a fully independent trade policy. In the next section we define a measurement framework based around six pillars we have observed as being crucial to success globally. These are not the specifics of which agreements or policies should be pursued, but rather a set of criteria that reflect whether a country has a sufficient and realistic understanding of their priorities and constraints in implementing a trade policy. We then consider how the UK is currently performing against these criteria, accepting that one would expect this to be to a degree a work in progress. However, this analysis should inform the priorities for future work. We intend to return to the UK performance against these criteria on a periodic basis. Our next survey is proposed for March 2019, on the eve of the UK leaving the EU. A third survey is currently planned for Autumn 2020, as the UK prepares to exit the Implementation Period. By this date it is envisaged that the UK will be on the verge of agreeing independent trade agreements. Given the length of time such negotiations take, they will need to commence soon. First, though, we consider the legacy of UK trade policy within the EU to provide some insight once we consider the pillars. i. Investment promotion has always been a UK competence. f. Promoting development has been another key focus of UK trade policy. These positions could be a starting point for future trade policy, noting in particular the consistent support for trade liberalisation. We already see this for example in the support for the aim of maintaining/replicating existing EU trade agreements. However, caution should be noted. There may have been some degree of tacit collaboration with other member states in the way priorities were expressed. For example, it is possible that the UK did not need to be defensive on agriculture or cultural services as other EU Member States could be relied upon to do this. Therefore, when UK trade policy is independent of the EU, defensive positions of the UK may be expressed with greater force. More importantly, the UK did not have to directly evaluate the interests of different sectors against each other within trade agreements, as this was done at the EU level. The UK put forward priorities, the EU negotiators then considered these against those of other member states and what was achievable. But implementing an independent trade policy, particularly one focusing on trade liberalisation, requires countries to make trade-offs between sectors, which can often be controversial. This is at the heart of the trade policy pillars to which we now turn. How should one analyse a country’s trade policy? While experts cannot specifically and unambiguously evaluate the impact of the totality of a country’s trade policy, there is clear evidence showing that trade openness and liberalisation support long-term economic growth. However, it is difficult to isolate the specific impact of trade policy alongside other policies in delivering this result. Success in trade policy is always contingent on the quality of economic institutions and the general degree of openness in a country to do business – abroad and at home. While it can be assumed that the UK will continue on its path of a high degree of business openness and quality of economic institutions, the purpose of this analysis is not to measure and evaluate market and trade openness but the specifics of trade policy. There isn’t one obvious benchmark for the evaluation of a country’s trade policy. Within the UK there has been some focus on how many trade specialists are employed by the government, and certainly government and stakeholders require sufficient expertise for a country to benefit from trade. Another proxy measure (widely discussed in the UK given the large number of EU agreements of various sorts to which the UK is a party) has been the number of Free Trade Agreements (FTAs), coupled with membership of the WTO. However, this is problematic as FTAs vary in scope and depth, and can divert as much trade as they create. Moreover, there are other agreements covering trade. For example, does an ‘open skies’ agreement count, or a Mutual Recognition Agreement? The major difficulty with measuring trade policy is that it is so broad ranging, with multiple purposes and tools. Take as a starting point the common perception that a country’s trade policy should increase the exports of goods. A trade agreement can facilitate this by for example seeking to eliminate tariffs, reduce border procedures and align regulations with a trading partner. However, none to date has eliminated all tariffs and aligned all regulations. Indeed, very few trade agreements can be said to have aligned a substantial amount of trade-relevant regulations. Given this situation, a government has to prioritise, immediately picking winners and losers among exporters. There is a strong argument that encouraging imports is a valid trade policy priority because they improve consumer benefits and lower the cost of inputs for producers. This often raises further questions, either related to perceived vulnerable domestic producers or supposed unfair competition. For example, it is often argued that removing barriers to imports could threaten the continuity of domestic producers, particularly if they are thought to be cheaper due to coming from countries with lower labour standards or because they don’t meet stringent safety standards. These arguments can be politically popular even if economically sub-optimal, and encourage the inclusion in trade agreements of wider provisions aimed at ‘levelling the playing field‘. That is just goods. Services and regulations introduce further complexity and sources of controversy. The question of whether a country’s public services could be run by companies from other countries, even possibly outsourced geographically, is inherently political. Similarly, there are often arguments that certain sensitive services should only be provided by companies based in the territory. Then there are broader rules such as the protection of intellectual property and disciplines against distorting competition through state aid, which return us to the question of ‘levelling the playing field’. This brief survey shows why trade policy frequently leads to controversies, and that is without considering issues such as the proposed investor state dispute settlement mechanisms in the Trans Pacific Partnership (TPP) and Transatlantic Trade and Investment Partnership (TTIP) which were the focus of significant protest. In recent years politicians may have been guilty of simply assuming that trade agreements such as these would deliver economic benefits and will therefore be almost universally popular. This was not even the case when trade agreements just covered tariffs, and it is certainly not the case now. Governments have to work hard to persuade their populations that trade agreements deliver positive results and find that a struggle, especially given the difficulty of providing an economic ‘proof’ for the benefit of a proposed trade agreement. Below we run through a more detailed definition of these pillars, prior to an assessment of the UK’s performance against them. Take the TPP as an example of the merits of consensus. Successful trade policy needs to be able to survive elections and change of governments. Once TPP negotiations finished, the final agreement needed to be ratified by participating governments. In New Zealand, that part came soon after a change of governing party. In the United States, there was an important change in the White House before the US Congress had passed the relevant legislation. The new government in New Zealand passed the TPP bill. One of the first moves of President Trump, however, was to sign the US withdrawal from the TPP. If a country is to achieve their trade policy objectives in agreements with others, it needs to ensure there is sufficient support for these across party lines, particularly given that trade agreements often take longer to negotiate than a single political cycle. Some limited renegotiation of a trade agreement after an election is typical, but if this is a complete restart the time of negotiators has been wasted and more significantly trade policy aims not achieved. It is therefore important that different political parties, especially those aspiring to lead governments, have a sufficient degree of commonality in their approach to trade policy. Beneath surface rivalries there should be shared goals and strategies that will prevent a change of government from fundamentally derailing trade agreements and key elements of trade policy. It is in the nature of political debate to emphasise differences and underplay agreements. But on the main issues – such as which countries we should negotiate with, the relative importance of different sectors, and the role in trade agreements of wider non-trade objectives such as the protection of labour and the environment – a broad political compact is needed . To a large degree the political consensus depends on achieving success in the other two areas. We can expect elected representatives to be lobbied by campaigners for various causes touched by a trade agreement, and of course by businesses concerned they are being insufficiently protected or promoted in the agreement. If these elected representatives don’t get satisfactory responses from their leaders, concerns will only mount, something the UK previously saw with campaigners raising the NHS in the context of TTIP negotiations. Starting with the regional dimension, trade negotiators know the importance of ensuring all substantive regions are able to point to some clear successes from a trade policy, and that no region seems to unequivocally lose out. In the case of the UK there was pressure during TTIP negotiations to be able to show possible benefits for Scotland (for example lifting the US ban on haggis) and Wales (allowing Welsh lamb to once more be sold in the US). In the US, the importance of agriculture in trade agreements can be ascribed at least in part to equal senate representation from all states, for many of whom agriculture is the most significant industry. The political importance of agriculture could also become an issue for UK trade policy. If New Zealand lamb exports appeared to threaten the sustainability of the Welsh lamb sector, for instance, UK governments may well issue promises of trade protection to the sector, particularly if the liberalisation of lamb imports wasn’t balanced with benefits of particular value to Wales. The alternative would be the possible withholding of support for a final agreement from a large number of MPs. Finally, the possible impact on different regions in the priorities of the other party also needs to be taken into account. For example, recognising the importance of US states in the TTIP talks, the UK government commissioned a study to show how each state of the US would benefit. Consensus is needed early in the negotiation process. Negotiators of trade agreements know they must put forward a final agreement which can gather sufficient support, but they won’t get that far if the politics of the agreement is charged. Then the government won’t be able to formulate a strategy for a trade negotiation that is coherent, attentive to own priorities and those of the negotiation parties, and that invites trust from key stakeholders. Ultimately, the government could be stoking opposition to the trade deal under negotiation rather than putting itself in a position where it can be efficient. A final point: domestic consensus is not just relevant to trade agreements. There are also other important parts of trade policy. Trade defence measures, given they involve the protection of domestic producers (potentially against the interest of consumers or producers using raw materials) are inherently controversial. These are often handled in a quasi-judicial manner to remove some controversy, but this must be grounded in an agreed approach. Given the controversy when UK embassies have been alleged to be helping UK tobacco companies, even the kind of trade diplomacy that involves raising specific cases requires some consensus. Given the economic benefits that trade brings, clarity in this area may be thought of as the most straightforward. However, assessing the potential benefits from a trade agreement can be complicated. Tariff reductions should be purely economically beneficial, though noting the possible political difficulties outlined above on the need to achieve consensus. Other areas could be more marginal. For example, services trade is a particular strength for the UK, but that does not necessarily mean that services should get priority over everything else. It is first necessary to know whether it is realistic to achieve liberalisation in a particular area, and then to evaluate the degree to which the potential liberalisation would have an economic impact. Malta’s restriction on pharmacy services is not economically important, but EU restrictions on postal services and US restrictions on maritime transport are. The two latter examples however will be extremely difficult to achieve while negotiating access in the first example is more realistic. These potential complications do not remove the contribution trade liberalisation can make to economic growth, they just make it more important that there are clearly beneficial aims for trade policy as a whole and, ahead of starting negotiations, for specific agreements. Alongside this, the UK government should make a robust commitment to measuring emerging trade policy and individual trade agreements. There should also be a commitment to deepening understanding about the opportunities that trade agreements create for the competitiveness of firms and job creation. Trade policy cannot just focus on the purely economic aims. There must be equal clarity on the broader political purpose of an agreement and to provisions in trade agreements that seek to “level the playing field”. For example, the US and EU have both recognised the importance of labour and environment provisions in trade agreements, but with differing approaches to date. The UK will come under pressure from those who want to see strong provisions in this area, such as adherence to all International Labour Organisation (ILO) core conventions, and those who feel such provisions could restrict the opportunities available from trade policy. Such questions require early resolution. There is a range of possible trade policy tools to take forward the aims of trade policy once defined. To list the most significant there are bilateral, plurilateral and multilateral trade agreements, other agreements such as investment protection or mutual recognition, initiatives to agree new global standards, trade defence measures, and trade diplomacy to remove market access barriers. Even a well-resourced country can’t focus on all countries and all tools at the same time. Choices have to be made. An FTA with the US will deliver greater benefit than one with Chile, but the latter should be more flexible on content, while US asks of the UK may be difficult to accommodate particularly if the UK remains close to the EU regulatory system. A new WTO round looks unlikely, even plurilateral agreements like the Trade in Services Agreement (TiSA) are currently stuck, but the latter could open up more economic benefits than a number of individual agreements. Producing a top ten or similar list of realistic and beneficial targets is therefore essential – while not completely ignoring all other countries in particular as exporters may require assistance with unfair barriers in any country. ‘There should be more transparency’ is an easy argument to make, and hard to dismiss. Key planks of the ambition with a new trade agreement, including the trade-offs at stake, need to be openly discussed. However, having a running commentary about each and every aspect of a trade negotiation reduces the chances of reaching agreement (mostly because negotiators must often finely balance the different interests, and presenting that fine balance at the end is the best chance of success). One of the best efficiency arguments for a reasonable degree of transparency is to ensure that stakeholders with genuine concerns do not join forces with those who merely want to oppose, who will often use the transparency argument as an easy line of attack. b. Transparency will actually lead to better trade policy. ii. Final publication of text along with accompanying explanatory notes ahead of final vote in the parliament. This entails a considerable amount of work for a trade policy department, as well as other parts of government heavily involved in trade policy, but must be seen to be carried out effectively and support the pillars of clarity and consensus. The mechanisms of consultation are not covered in detail here, but should include debates in the parliament and open meetings involving officials across a country. Serious consideration must also be given to the question of whether a negotiating mandate should be made public, which the EU grappled with during TTIP talks. With both the EU and US now publishing documents on the aims of trade talks, it would be strange for the UK not to do so. This level of transparency will also make for better trade policy. If a government wants to reduce barriers for companies they need to know the detail of these. Then, after discussing with the negotiation partner(s), they need to verify the other party’s information and solutions. The same could apply to NGOs if the issue was focused on rules sections such as those on the environment. Typically, anti-trade NGOs complain that governments negotiating trade agreements spend too much time talking to business. This is unreasonable, given that trade policy is primarily aiming at economic benefit. If governments do not spend time discussing specific issues with businesses they will not deliver good agreements. However, time must also be spent with other groups for reasons outlined above. A successful trade policy also needs a degree of accountability. At a minimum, it should be expected that there will be a parliamentary committee which will closely examine the details, including those of specific trade agreements. The European Parliament’s International Trade Committee holds hearings and produces resolutions on what they hope to see in specific areas, and also meets negotiators privately to discuss progress. In this way they can help avoid particular political controversies. The EU also develops for all agreements a Sustainability Impact Assessment providing a large amount of impartial detail, and an opportunity for stakeholder input to a neutral team. Ideally one would also want accountability in the form of an independent body which could scrutinise trade agreements and related policies, reporting on likely results, and proposing improvements and alternatives. The Productivity Commission in Australia is well regarded by many in the trade policy field, though its remit goes wider. Such a level of accountability by a combination of parliament and independent body goes beyond what currently exists in the UK. Harvard economist Dani Rodrik’s recent paper on trade agreements contained a strong note of scepticism. He says: “Rather than neutralizing the protectionists, trade agreements may empower a different set of rent-seeking interests and politically well-connected firms – international banks, pharmaceutical companies, and multinational firms. They may serve to internationalize the influence of these powerful domestic interests.” Those who have worked on trade policy would recognise some elements of Rodrik’s concern: trade agreements could be easily used by well-resourced interest groups pursuing their own agendas. This could be at the expense of smaller players, and possibly both political support and economic gain. b. International fairness, especially the impact on developing countries. Ensuring fairness and the perception of fairness is a way of addressing concerns about trade policy, but is also a reflection of a process which is going to see interests compete to obtain results. A team of lobbyists providing economic and political grounds to governments for a certain course of action, even if protectionist, can often be more persuasive than a single company asking once for a small change in another country’s process to allow them to export. A government must be able to show that a trade agreement is not just beneficial for the large organisations of all types, but rather provides a spread of benefits. In the long term this is also likely to be more economically beneficial. In a domestic sphere fairness means that the government is clearly consulting with a wide range of interests – small and large companies, consumer groups and other NGOs – and giving attention to their priorities. This can be difficult as small companies and consumer groups often lack the resource to raise their issues in an effective way with the government, compared to larger companies or NGOs. Small business organisations like the Federation of Small Businesses (FSB) in the UK can and do raise issues but find it difficult to go into specifics. Sectoral organisations such as the Scotch Whisky Association that can represent both large and small companies can help significantly, but not all small companies will be part of such a grouping. It has typically been the response of governments and some others in the trade policy community to argue that the general barriers lifted by trade agreements will help small companies, but when large corporates have the resource to raise specific issues there is a clear fairness issue. Governments therefore need to work hard on this issue, initially in providing clear, understandable and comprehensive information, including how to raise problems. These in turn need to be considered by governments with equal seriousness. This is something the EU has been improving, and others could learn from this. There is also an international dimension to the fairness question, heavily linked with the trade aspects of development that have been recognised in WTO agreements. It is widely recognised that preferential treatment for developing countries is a way to help their economic growth, and this is seen in various schemes for unilateral preferences and asymmetrical Free Trade Agreements such as the Economic Partnership Agreements signed by the EU and various countries. Aid for trade programmes are another way in which countries such as the UK assist developing countries. In the priorities that a country pursues in trade policy, the development impact should be considered alongside agreements with larger economies – and this could include the trade diversion effects of agreements with other developed countries. Equally the policy content of agreements with developing countries needs to be carefully considered, particularly noting for example controversies over the use of Investor State Dispute Settlement (ISDS) mechanisms in developing countries, and indeed the abandonment of treaties containing ISDS by South Africa. The broader subject of trade and development is beyond the scope of this paper, but the UK has good precedent to draw upon. The pillars provide us with the need for clear and beneficial aims which are widely agreed through a transparent and fair process. The implication of this though could be a rather passive one, that governments will just do enough to have a trade policy which is acceptable, but which will not provide a real direction for the future. The status of agriculture, frequently a source of amusement or despair among trade policy professionals, is a fine example. The output of US farms contributed about 1 percent of GDP in 2015 and yet a US trade agreement could not be completed without the agreement of the sector. Few other sectors hold such a veto. The situation is not too much different in the EU. Notwithstanding the valid reasons for agriculture to hold some position of importance (ranging from a sentimental attachment to the land to issues of rural employment and security of food supply) it would be depressing for the UK, designing a trade policy almost from scratch, if agriculture is the most important sector. c. New approaches in existing export areas. It is critical to figure out the role of data in trade agreements. The digital economy is obviously important for economic development, and digital trade has been frequently discussed in the trade policy context. While there is no doubt that data is an increasing part of global trade, important not just for services but also supporting many manufacturing products, it is less clear from this discussion whether there are any unique opportunities available to the UK through an intelligent application of the policy. It is not unreasonable to think this would be possible, but it is likely to require greater thought than simply assuming such opportunities are there. At the very least, support for free data flows would demonstrate a desire to maintain and enhance trade. New ways to tackle non-tariff barriers to trade and reduce the cost of regulatory divergence is also critical for trade policy to deliver benefits. Regulatory coherence and NTBs have been the subject of much commentary in the trade world in recent years, though few trade agreements tackle the issues in detail. Slow progress in international organisations such as UNECE, a standard-setting body, continues to be the norm. TTIP was a particularly ambitious effort to bring more alignment through a structured process, and while this made more progress than some other parts of the talks, it was in the end untested. Meanwhile it is unlikely that the EU will want to replicate single market mechanisms in a free trade agreement with the UK. Nonetheless there may still be opportunities for the UK given regulators, standard setters and conformity assessment bodies are reasonably well respected. These opportunities could include mutual recognition agreements on regulations or to avoid double testing, developing regulations more quickly than larger economies in emerging areas to encourage innovative business, and exporting our conformity assessment services. However, agreements in this area can work both ways, opening the possibility of UK regulations being changed due to a trade agreement, such as the typical US ask to include transparency in medicine pricing, which will require careful handling. A trade policy that focuses on the future should also include “old” sectors and new ways to promote them. Given the success of UK government efforts to promote and protect Scotch Whisky, there could there be other food and drink products which could be emphasised in trade agreements. Perhaps UK craft beers could be promoted through UK trade policy. The services elements of manufactured products, for example the ability to provide effective after-sales care, is another interesting avenue to consider. The essential point in thinking about a future-oriented trade policy is that there are many areas that could be considered, and these need a considerable amount of rigorous analysis to see where realistic opportunities may arise. Some of this should be done by businesses themselves, but it also requires good internal government coordination as the trade department may not always become aware of the work or opportunities. These opportunities should be able to provide the UK with a positive benefit of being able to develop a new trade policy with only limited precedent. For trade policy to be successful, a government needs the capacity to deliver good agreements and implement them. This entails balancing all of the priorities given a finite resource, and putting in place an effective programme of trade policy delivery. A programme like that is going to be exceptionally wide-ranging, covering as it does potential interaction with all countries, on all topics. It is particularly critical for a country that is building up its trade policy. A government needs adequate resources and staff to deliver a successful trade policy. There have to be officials with the skills to negotiate trade agreements with other countries, and there has been considerable attention paid to the number of negotiators the UK, particularly the Department for International Trade, has employed. However, negotiation is only one part of successful delivery of trade policy; the other is actual implementation of the negotiated agreement. And for implementation to be successful, trade policy must be a genuine cross-government effort that involve many departments and authorities. Therefore, it is now important for the UK government to build up capacity across the government and ensure there is genuine agreement between different departments as to priorities. The publication of a clear programme of work is a good indicator of a government confidently pursuing a deliverable agenda. Such a programme would show the different negotiations, discussions, market access cases, trade defence measures and so on the government is working on. The most obvious example of this is the US Trade Policy Agenda and Annual Report, which lists this over several hundred pages. No other country however goes into quite the same level of detail though New Zealand’s recent Trade Agenda 2030 report lays out a future programme clearly. Such length is not necessary, more important is the presence of such a document which shows a clear direction of travel and subjects the government’s policy to discussion. A final measurement of deliverability is the preparedness of government to be open with stakeholders and the parliament about trade policy. Building on the earlier discussion on transparency, this would include the provision of timely and useful information to stakeholders, and builds on this to also include the scheduling of debates in Parliament, and the provision of clear information in response to questions raised. This is going to be important in building confidence that the government is really tackling the opportunities and trade-off required to have a successful trade policy. It also brings us back to where the discussion of the pillars started, with the need to build consensus. The UK’s post-Brexit trade policy is work in progress. Obviously, it will take more time to build up necessary institutions and qualities of trade policy. Since the country is still a member of the EU’s Common Commercial Policy and first needs to establish new agreements with the EU and the FTA partners the UK has through the EU, the future trade policy of the UK was initially less urgent. However, that future is not far away and for the UK to be ready for the day its independent trade policy starts, now is the time to accelerate its preparations. Given the strong indications by the government that FTA negotiations will soon be launched with countries like Australia, New Zealand, the US, and potentially TPP parties, it is even more important to move fast on all six pillars. Our scoring will be based on the best practice from those countries who have successfully implemented trade liberalisation programmes. There will inevitably be a degree of subjectivity in assessment, but we will take public explanations as our primary source. This is a proxy for the maturity of a policy position, that the level of public utterance reflects the Government’s confidence in their own progress. Delivering successfully: There are successful results of trade policy in this area, whether for the economy as a whole, specific business, or other interests. It should be noted that changes over time could see countries moving up and down the scoring scale for individual pillars, for example as they periodically review trade policy priorities, thus moving from Operational to Discussion, then moving back through Stability to Operational and Delivery. Thus we wouldn’t expect even those Governments experienced in trade policy to score 5 against each pillar. It is perhaps unsurprising that the UK has not yet made sufficient progress in developing an independent trade policy almost from scratch. The Brexit process is putting tremendous pressure on resource and political bandwidth, which any country would struggle to manage. Nonetheless it is disappointing that there are so few areas in which the UK government appears to be ready to openly discuss trade policy as a prelude to deployment. We can expect the establishment of a trade defence regime to take some time, and the commitment to maintaining development friendly trade policies is welcome. However, in too many areas the UK government does not currently appear to be ready to move beyond preliminary conversations towards positions which can be realistically debated in parliament. This lack of engagement risks creating significant problems just as the UK hopes to move beyond the Brexit debate and onto future trade agreements which generate economic benefits. As has been discussed throughout this paper, a successful trade policy requires numerous trade-offs between competing interests, in which the government has to pick winners and losers. At a time when trade policy is increasingly controversial a failure to do this runs the risk of failing to deliver any of the anticipated benefits. Worse, it could actively harm domestic businesses. The failure to understand the delicate domestic compromises required in trade agreements must therefore be rectified as soon as possible. It is simply unrealistic to expect the UK to think about launching trade talks with the US without this having been subject to some degree of discussion. The media has already been reporting US political expectations in areas such as agriculture and regulatory standards which are typical in their trade agreements. Such expectations are not likely to be accepted by UK stakeholders, and at this stage it is hard to see a UK-US trade agreement that could command majority support in parliament. In turn this has the potential to poison the debate on future UK trade policy, just as TTIP negotiations nearly derailed the EU trade deal with Canada. The lack of any recognition of this fact from UK ministers should be of major concern. We will return to the evaluation of UK trade policy in future reports, adding in more detail against the pillars now defined. We take a positive view of the ability of a country such as the UK to operate a successful trade policy, and will expect to see significant progress over the coming months to make a reality of this.